When she was eight years old, Minty Davenport took a trip to New York with her mother. Ever since she searched the Plaza for Eloise that winter, Minty has felt a special affinity for the Big Apple, so when she graduates from college, she heads straight for the core. Her syrupy drawl, sweet manners, and brightly colored clothing instantly set her apart from the other New Yorkers her age, and she finds herself quickly (but gracefully, of course) falling into the deep end of the pool. Minty must navigate a job for a poison-tongued publicist, a potential love interest who may not be all that he seems, and of course the never-ending parade of designer fashions that seem to pave the streets in this debut novel. As soon as I got a few chapters in to “Southern Charm” by Tinsley Mortimer, I had to stop and regroup. I was sure that I had heard this story somewhere before. 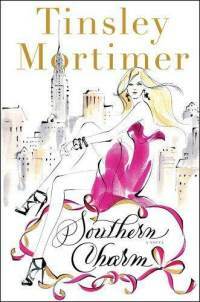 Sure enough, this novel is Mortimer's quasi-autobiographical book about a Southern belle being transplanted to New York City, where she uses her charm to set herself apart from everyone else. If you (like me) enjoy a healthy dose of celebrity gossip every now and again, you’ll find this story familiar, but that’s not necessarily a bad thing. It was a comfortable read, brought to life with a liberal dose of name-dropping. There were enough designer labels and trendy locations in this book to keep even the most avid celebutante addict hooked until the end. Anyone who is familiar with Tinsley Mortimer will know the storyline already, but it’s woven together in a fun, light, sparkly way that kept me reading until the last page. It was fun and fluffy, which was exactly what I was looking for when I picked it up. Even the cover art (a sketched-in blonde in a pink dress and strappy heels against the backdrop of a big city) was perfect for this book. It never got bogged down in details, and just kept skimming along the surface of Minty’s fabulous life. If you’re someone who is easily irritated by name-dropping, stay away from this one. It’s a fun and fluffy beach read, but the constant barrage of capitalized words can get a bit straining at times. There was even one point when I felt like saying to the main character, “Yes. You’re rich and entitled. We get it, already.” There were also a number of plot points that kind of came out of nowhere. I’m not one to question a lucky coincidence, but a series of them that has the main character’s life falling into place just because she knows the right people? Maybe. Good thing this novel was published as fiction, because I know that I sure wish my life went like that sometimes. All in all, Southern Charm was a cute book about a rich girl trying to make good in the big city. Yes, it’s been done before, but the consistent snaps back to the reality of Mortimer’s life certainly made this book a little more interesting than other carbon copies of this format. Fast and fun…why not put this one on your summer reading list? I have had my eye on this for some time. I could go for a light beach read after reading some heavier books, but I will probably put this one off for awhile longer. I appreciate the word of caution about the name dropping. I am not always hung up on details such as that. It entirely depends on my reading mood. I just loved this book! I thought it was adorable and the attractive cover ceratinly helped! Plus I'm from Charleston :) Glad you enjoyed! I can't wait to read this book. Sounds cute and perfect for summer. I think I'm gonna love that book. The cover is fabulous. And the story seems very exciting. I really love a book that doesn't make me feel bored at all.